Does this mean Ronnie and Jason are suspected of stealing some Russian technology and are now wanted men in Russia? There you have it, the Russian clues translated.. sort of. Obviously the translations aren’t perfect. However, some are clearly dead-on, such as the name “Fury”. Also, words like “entity”, “combination” and “America” clearly describe Fury, but might not be translated into a proper statement. Finally, in the drawing there appears to be a large face on the right-hand side. 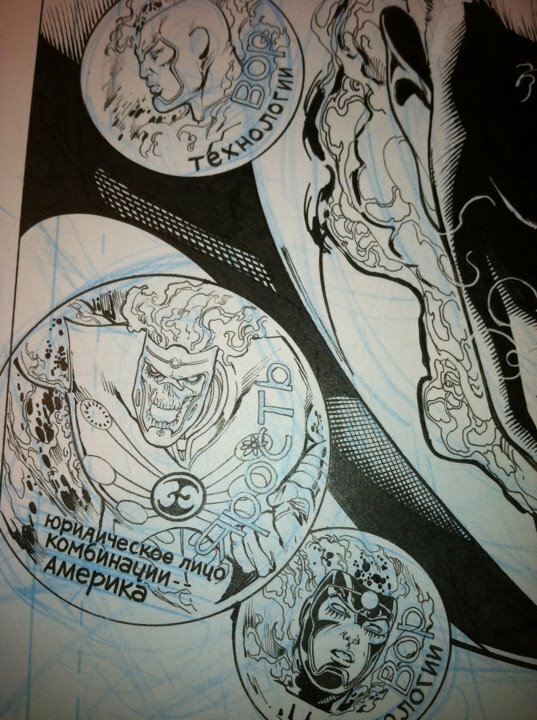 Given the Russian characters in the drawing, could this be The New 52 incarnation of Mikhail Arkadin? Could he be another Firestorm? Fingers crossed! Love the clues, Ethan! It’s fun trying to figure them out! Keep ’em coming! Posted in: Ethan Van Sciver, Firestorm #09: New 52 v1 (Firestorm Protocols), Firestorm comic vol. IV, Fury, Jason Rusch, Ronnie Raymond. I love the emphasis this book seems to be putting on what nuclear means in science, politics and culture–definitely stepping up (revitalizing?) the Cold War era threats and fears? Plus, if we have Russian scientists/soldiers chasing a couple of American teenagers… Man, am I the only one who is thinking about “Red Dawn” with this series? Probably has something to do with the Russian version of the Firestorm Protocols. ‘Legal person of the Combination America’ sounds like “Citizen of the United States of America” to me, but of course that’s just a guess. “The Entity (or Legal Person) of the Combination America” maybe instead “Citizen of the United States?” Love the full cover, by the way.